Since the liver is responsible for the selective uptake, metabolism and excretion of xenobiotics, this organ is highly predisposed to drug-induced toxicity: this essential function is the primary reason for the failure of pharmaceuticals during drug development (Ref 1.). Cholestatic and hepatocellular injuries are two of the most severe manifestations of drug-induced liver disease (DILD), therefore there is an interest to test these harmful effects as soon as possible during the drug discovery process. Acute and chronic cholestatic liver injuries result from the dysfunction of the mechanisms of bile formation. To assess the cholestatic effect of chlorpromazine (CPZ), we cultivated HepG2 cells in BIOMIMESYS® hydroscaffold and exposed the resulting spheroids to increasing concentration of CPZ for 24 hours. The 5(6)-carboxy-2′,7′- dichlorofluorescein diacetate (CDFDA), a synthetic substrate of MRP2 transporter that fluoresces green when hydrolyzed by esterases, was used to observe the bile canaliculi constriction or dilatation at the end of the exposure to CPZ. 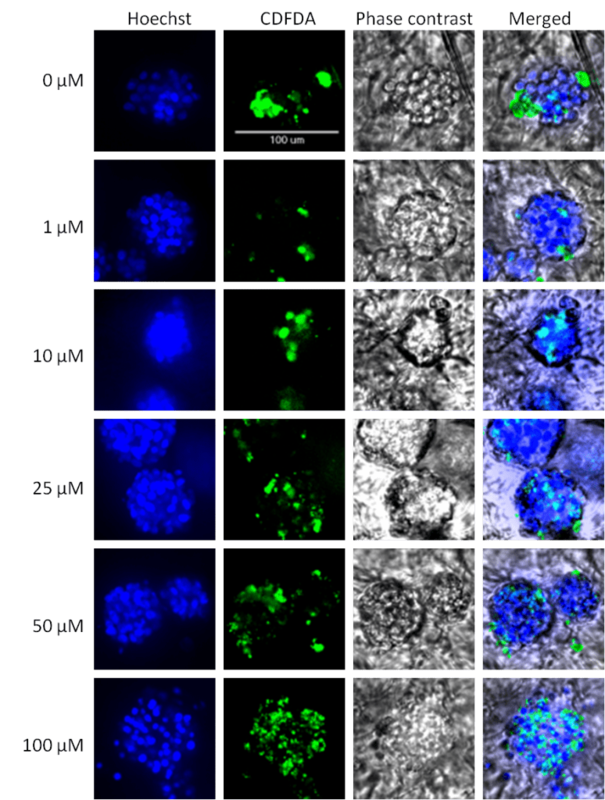 Using Molecular Devices’ ImageXpress confocal systems, MetaXpress software and its ‘Granularity’ application module, we could clearly quantify the constriction of bile canaliculi in spheroids! These results demonstrate that the physiological 3D cell cultures allowed in BIOMIMESYS® make possible the study of acute – and chronic ! – cholestatic liver injury using high-content screening (automated confocal microscopy). If you are interested in these data, we invite you to read our application note with Integra or to contact us to discover the linked HCS services! Padda MS, Sanchez M, Akhtar AJ, Boyer JL. DRUG INDUCED CHOLESTASIS. Hepatology (Baltimore, Md). 2011;53(4):1377-1387. doi:10.1002/hep.24229.